Exceptional baths made by exceptional people. Every Aquatic tub is the product of the highest standards of American craftsmanship. 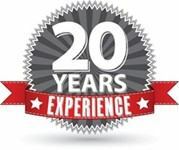 Hydrotherapy spa products and soaking bathtubs, all made for years of use and enjoyment. Aquatic has never been a company that goes with the standard flow of product design and manufacturing. Always innovating and pushing forward, their advantage is they have the experience and ingenuity to take something as ordinary as a bathtub and elevate it into something beautiful, highly functional and inspiring. Whatever soothing powers you need, they have the innovation to deliver. Whirlpools target aching muscles with pulsating jets of water, while air baths provide an all-encompassing massage. 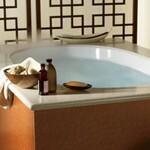 Deep, heated soaking tubs provide gentle stress relief. Aquatic also offers hydrotherapy models that combine all options in one for the ultimate in relaxation. With more than 150 models across six series, it's a selection that provides an unbeatable range of shapes and sizes for any decor and every budget. Once your tub is ordered, it is created especially for you at Aquatic's plant in Virginia. After passing their highest standard of excellence, it is shipped directly to you. No refurbished, reconditioned tubs are allowed. Fully warrantied by Aquatic. And your tub only makes one trip - from the manufacturer to you. As elegant as the name implies, the Estate Collection offers deep bathing wells, sleek design and up to nine massage jets. Featuring a neck-and-shoulder therapy system, these baths target tension points with powerful circular massage. Discover seemingly endless choices for relaxation. The modern design alone is enough to inspire a feeling of calmness, but a combination of Shiatsu massage and air bath therapy makes an Infinity bathtub an absolute pleasure to experience. Available in single- and two-person designs, all with neck pillow included. Experience the luxury of whirlpool baths built for two. Invitingly spacious and engineered to deliver ultimate relaxation, Millennium features include perfectly positioned water & air massaging jets, heaters and sculpted armrests. Who says you can't have it all? From freestanding and drop-in options to your choice of hydrotherapies, Serenity offers the ultimate in personalization. Select from an air bath, DriftBath, HotSoak or soaker exclusive in a variety of colors, styles and finishes, from 59" -73". A warm bath can provide welcome relief from daily stresses, aches and pains. When the bath is full of therapeutic bubbles, streams of swirling water or both, you have the prescription for ultimate relaxation. Powerful jets give you a deep-tissue massage to relax even your most knotted-up spots. Plus, you can adjust different jets to target muscles. Air baths deliver a gentle, all-encompassing massage. Water and air work together to soothe and stimulate the senses. With the simple touch of a button, tiny bubbles dance around your body, delivering an invigorating massage you can feel from head to toe. Streams of water to soothe your body, and it’s available exclusively from Aquatic. Soothing, water-only hydrotherapy experience uses a soft current to create a relaxing blanket effect, without any jet action or vigorous swirl of bubbles. Heat generated by the motor is captured and used to keep water warm, eliminating the need for a separate inline heater. Sometimes feeling better is as simple as a long, HotSoak. Extended warm-water therapy opens pores, improves circulation and relaxes the body. Constant circulation and an inline heater keep the water at just the right temperature while you linger. While most manufacturers settle for single molded tubs, Aquatic baths are double hulled. It costs more, but the strengthened mold helps ensure structural integrity and enhances durability. No other bath is built to last longer. To combat bacteria buildup, Aquatic tubs use a combination of rigid and flexible piping in the lines. That translates to pipes that don’t sag and stretch over time, which can cause bacteria growth in the lines. That’s simply unacceptable. If Aquatic baths sound quieter than others, that’s by design. Aquatic tubs come equipped with leveling legs to perfectly fit your bath to your floor. And available ABS structures help dampen vibrations and sounds for whisper-quiet operation. If it seems like there’s more to an Aquatic tub, that’s because there is. 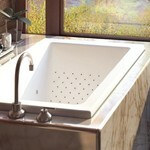 Their deluxe hydrotherapy products, for example, feature durable and beautiful acrylic surfaces. That helps to ensure that the bathtub you love now will keep its beauty and color for the long run.